It was a privilege to present to South Australian church Ministers, Treasurers, Elders and leaders at two seminars held at Blackwood and Elizabeth Churches during May. 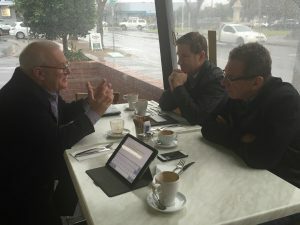 We were encouraged by the positive feedback and the willingness of churches to explore how they can work together with CCFS to expand church mission in South Australia. Following the South Australia launch of CCFS in April, these seminars were a valuable next step forward in outlining our mission. Simply by switching transactional and investment accounts from their current bank to CCFS, churches are able to harness their collective financial strength to fund the ongoing needs of the movement. During the day we were inspired by the opportunity to visit Blackwood, Elizabeth and SouthPoint Churches and inspired by the time we spent with Graham Agnew (Blackwood Church, pictured) and Lindsay Mayes (Elizabeth Church) as they talked about what God is doing in South Australia. Over 20 churches were represented and we want to extend our thanks to Graham, Lindsay, Jean Smith and their teams as well Greg Elsdon, Phil Burgess & Mark Riessen (CCSA & NT) for their hospitality and hard work in coordinating the events. We are excited about the years ahead and the opportunities they will bring.